Some of the most used and abused Bible verses! Context is everything: Everyone says that we should read the Bible in context. However, I am convinced that at least some, who say this, have less than the most superficial understanding of what context is. I don’t usually compliment Evangelicals; however, sometimes they get it so right. I was listening to a talk given by an Evangelical minister. He was saying that the person, who hangs his hat on one verse of Scripture, while ignoring other relevant verses, is very likely to come up with an incorrect understanding of the verse. This man seems to have a good grasp of the larger context. At another time, I was listening to an Evangelical minister quote the Bible as saying “There is no God.” I think an atheist would be happy with his statement, but of course, he didn’t stop there. That little phrase exists in a number of places in Scripture. His point was this; you cannot quote Scripture without bringing in the clarifying words that exist too properly understand the verse in its context. He then went on to give the phrase with the clarifying words, “Fools say in their hearts, there is no God.” (Psalm 53:1). With the clarifying words the verse means something entirely different. Some might say that the explanation given by the Evangelical minister is simplistic. I don’t think this minister was being simplistic. I believe his explanation is both simple and profound at the same time. Context is violated frequently because people are either leaving out or ignoring clarifying words. WHO said only God can forgive sins? WHAT clarifying words are being left out in a failed attempt to show that images of the Saints are in violation of Exodus 20? WHY did the Jesus speak against tradition and the Apostle Paul speak for tradition? THE WHO OF IT ALL: Who is speaking in a Bible verse can make a huge difference. I am often times confronted with the statement “Only God can forgive sins” apart from man. Why is it that some people believe that only God can forgive sins? The answer is simple, because there is a verse in the Bible that says so. “Who but God alone can forgive sins" (Mk 2:7)? The bible says it, therefore it must be true and so, from their perspective, they conclude it is wrong for a priest to forgive and retain sins. How can a priest forgive and retain sins in the Sacrament of Confession if it is seemingly forbidden in Scripture? I always ask the person with this type of reasoning, who made this statement; “Who but God alone can forgive sins" (Mk 2:7), was it Jesus or one of the Apostles? They usually have no idea. Actually, it was neither Jesus nor any of His Apostles who made the statement that only God can forgive sins; it was coming from the Scribes, who accused Jesus of blasphemy. “Now some of the scribes were sitting there asking themselves, "Why does this man [Jesus] speak that way?” (Mk 2:6). One person wrote to me on Facebook and said that he didn’t care if it was a scribe who opposed Jesus; it is in the Bible and therefore you must believe it. I told him fine; however, in order to be consistent, then he must also believe this same scribe who said that Jesus is a blasphemer because this is in the Biblical context as well. To this he had no response. “Now some of the scribes were sitting there asking themselves, ‘Why does this man [Jesus] speak that way? He [Jesus] is blaspheming. Who, but God alone can forgive sins’" (Mk 2:6-7)? In believing that only god can forgive sins, apart from any man involvement, he didn’t seem to realize that he was aligning himself with the scribes who were accusing Jesus of blasphemy. Who can forgive sins? Jesus answers this question very nicely and he didn’t say; only God can forgive sins apart from any man, he included man. In fact as we look at John 20, we find that Jesus gave the Apostles the power to forgive and retain sins. "Peace be with you. As the Father has sent me, so I send you." And when he had said this, he breathed on them and said to them, "Receive the holy Spirit. Whose sins you forgive are forgiven them, and whose sins you retain are retained” (Jn 20:23). People who believe that only God can forgive sins apart from man involvement are at odds with Jesus who gave the Apostles the power to forgive and retain sins. And so we contrast the statement of the scribes who opposed Jesus “God alone can forgive sins” with Jesus who gave the Apostles the power to forgive and retain sins. In both cases, whether you listen to the Scribes or to Jesus, you have a Biblical precedent. And so the question is this, which precedent will you follow in the Bible? Will you follow the scribes who accused Jesus of blasphemy or Jesus who gave the Apostles the power to forgive and retain sins? The who of it all is important because it was not Jesus or His Apostles who said “only God can forgive sins” apart from man; it was the scribes who opposed Jesus and accused Him of blasphemy. And it was Jesus who gave to man the power to forgive and retain sins. THE WHAT OF IT ALL: When reading Scripture what is being said and what are the clarifying words? I was once asked by a Baptist friend as to why we make graven images of Mary and the saints, since the Bible prohibits this practice. “You shall not carve idols for yourselves in the shape of anything in the sky above or on the earth below or in the waters beneath the earth; you shall not bow down before them or worship them” (Exodus 20:4-5). In response to her, I asked this question; "did Mary and the other Christian saints exist at that the time of Exodus"? She answered, "no"; they didn’t exist till many centuries later. I then said to her, if the Christian saints didn’t as yet exist till many centuries later than what were they speaking against in Exodus 20? She said that she didn't know. I further explained that in order to carry Exodus 20:4-5 forward to see if you can apply it to Mary and the other saints, then you first have to go back and find out what exactly were these images. If we look at Exodus 20:3, we find out what these images are in order to determine the context. Verse 3 does not say all carved images, but idols of “other gods”; "You shall not have other gods besides me" (Ex 20:3). And so the next question is this, are the saints and Mary other pagan gods in competition with the one true god? She answered "no, the saints were not pagan gods". They were friends of the one true God. And so if we use the graven idols (other gods) in Exodus 20:3-5, against the Christian saints, who are not other gods, then we are using the Bible out of context. She got this whimsical look on her face and began to smile and said “I never thought of it that way before.” When, Gina realized that she had been taught Scripture out of context in her Baptist faith, she eventually found herself worshiping God in the Catholic Church. I find time and time again, when people quote Exodus 20, they will quote verses 4 and 5, while leaving out verse 3 the context. Why is verse 3, the clarifying words that give us the context being left out? The answer is simple, their tradition has taught them that images of the saints are in violation of Exodus. Now they have to give this argument up because the moment verse 3 is quoted, you realize it is speaking of idols of “other gods.” The Christian saints are not other gods but friends cooperating with God. There are some who would like us to believe that Exodus 20: 3-5 is a prohibition against ALL images, when in fact the text limits the images to that of OTHER GODS. As the Evangelical minister correctly pointed out, clarifying words are important. We need them in order to understand the Bible in context. And furthermore God ordered images of angels and a snake to be made. Was God in violation of Exodus 20:3-5 (no carved idols) when he ordered images in the sky and on the earth? No, He was not because these images were not carved idols of other gods, but images that were being used for His good purposes. “Make two angels of beaten Gold for the two ends of the propitiatory” (Exodus 25 17:18); And the Lord said to Moses, “Make a seraph and mount it on a pole, and if anyone who has been bitten looks at it, he will recover” (Nm 21:6-9). When God ordered images to be made, He was not in violation of His own commandment? “You shall not have other gods beside me. You shall not carve idols for yourselves in the shape of anything in the sky above or on the earth below or in the waters beneath the earth; you hall not bow down before them or worship them” (Exodus 20:3-5). The what of it all is important. What are those clarifying words? In this particular case, the clarifying words which are often times being left out are “other gods”. The Christian saints are not other gods, they are the friends of the one true God. THE WHY OF IT ALL: WHY did Jesus speak against tradition when the Apostle Paul spoke for tradition? Here is a direct quote from the pamphlet put out by Christian Equippers International in their little publication speaking against Catholic teaching. "However, Jesus rebuked the usurping and undermining of scriptures through man-made tradition when He said, 'The worship they offer me is worthless, the doctrines they teach are only human regulations. You put aside the commandment of God to cling to HUMAN TRADITIONS . . . In this way you make God's word null and void for the sake of your TRADITION which you have handed down'" (MK. 7:7, 8, 13, J.B.V.). For them it is an open and shut case. Jesus spoke against human tradition. The Catholic Church speaks in favor of tradition and so the Catholic Church to them is in clear violation of the Bible and Catholics should leave their Church and join their Bible Church. Note there are three dots where they leave our verses 9 through 12, the full context, the corrupt “Corban” tradition that is in violation of the fourth commandment. Why did they leave it out? Once people realize that Jesus was speaking against corrupt man-made tradition and not all tradition, you can no longer use this against the Catholic Church when it speaks for tradition. "How well you have set aside the commandment of God in order to uphold your tradition” (Mk 7:9). This is the nullified commandment that Jesus was speaking about. "For Moses said, 'Honor your father and your mother,' and 'Whoever curses father or mother shall die.' Yet you say, 'If a person says to father or mother, "Any support you might have had from me is qorban"' (meaning, dedicated to God), you allow him to do nothing more for his father or mother” (Mk 7:10-12). When I was first researching literature that spoke against Catholic teaching, this was for me, one of the most glaring examples of taking the Bible taken out of context in order to serve an anti-Catholic agenda. I remember thinking that if they need to show the Bible out of context in order to prove that the Church is wrong, then maybe the Catholic Church is right and the most Biblical of all churches. Yes, Jesus did speak against man-made human tradition; however, He did not speak against all tradition. He spoke against a corrupt tradition that was in violation of the fourth commandment. This human tradition (qorban) was in violation of the 4th commandment, “Honor your father and your Mother.” This is why Jesus said; "you nullify the word of God in favor of your tradition that you have handed on" (Mk 7:13). Jesus opposed it, not because He opposed all tradition, but a specific corrupt tradition that nullified the word of God. "Honor your father and your mother, that you may have a long life in the land which the Lord, your God, is giving you" (Exodus 20:12). "Hold fast to the traditions that you were taught, either by an oral statement or by a letter of ours" (2 Thess. 2:15). What do people do with this verse when they are speaking against tradition? They do not bring this verse up and they hope that their reader or listener is unaware of it. Vatican II says that both sacred tradition and sacred scripture is to be accepted and venerated with the same devotion and reverence. 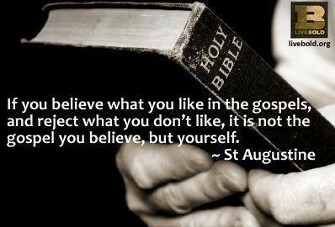 If the Bible speaks for some tradition, a person cannot speak against all tradition without denying part of the Bible. And so why did Jesus speak against tradition and Paul speak for it? Jesus spoke against corrupt tradition and Paul was speaking for Biblical tradition that was not in opposition to any of the commandments. The Church draws from both the Bible and tradition and honestly admits it and non-Catholic churches also draw from both the Bible and their tradition, and sometimes don’t admit it. I have given three different examples of how specific Bible verses are misused and how this can be remedied by a proper understanding of context. WHO: We need to ask who is speaking. It was the scribes who opposed Jesus and accused Him of blasphemy, who said “God alone can forgive sins” (Mark 2:6:7). It was Jesus who breathed on the Apostles and gave them the power to forgive and retain sins, (John 20:23). WHAT: What are the clarifying words that help us too properly understand the meaning of any given verse? What were those idols spoken of in Exodus 20:3-5? They were pagan idols of "other gods, ” not to be confused with images of the Christian saints, who in no way qualify as Pagan gods. WHY: And why is a particular verse being spoken of at any given time? Once we take the statements of Jesus and Paul in context, we understand that Jesus was speaking against corrupt tradition and Paul encouraged his followers to "hold fast to the traditions that you were taught, either by an oral statement or by a letter of ours" (2 Thess. 2:15). It is important to look at the immediate context both before and after a verse. Also notice the larger context in the whole of the Bible, especially parallel passages. It can also be helpful to check and see how the historical Church has understood a particular verse, noticing the commentary of the early Church Fathers and councils of the Church?